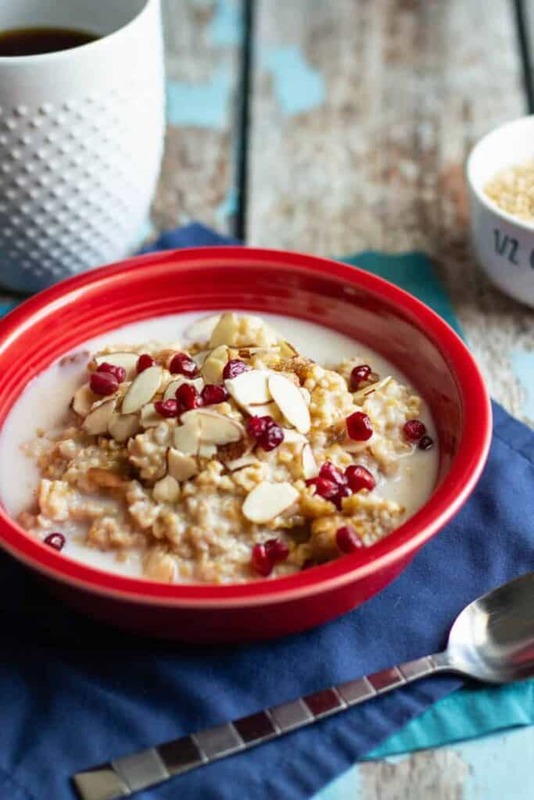 These Pressure Cooker Steel Cut Oats are healthy, delicious, and endlessly customizable. Even better: they take hardly any time at all to make AND are almost entirely hands-off. 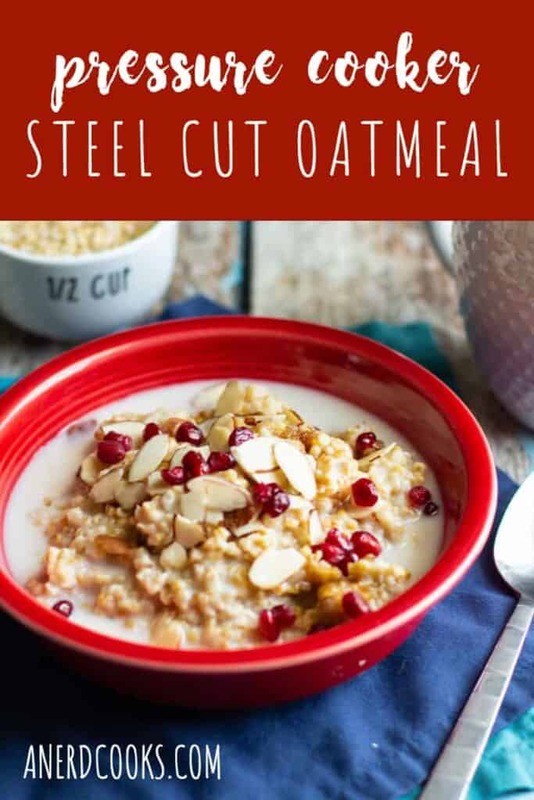 When making oatmeal for the week, my go-to recipe has been this one for Slow Cooker Steel Cut Oats. The only downside to it is that it takes several hours to cook. When pressed for time one Sunday, I decided to try making oatmeal in the pressure cooker. 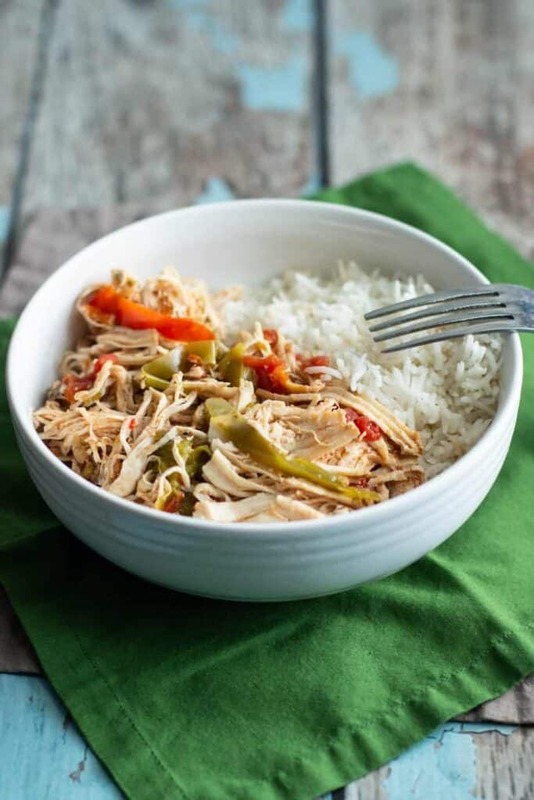 Just like the slow cooker method, this method is almost entirely hands-off. The resulting oatmeal is tender (but still has a nice texture) and is basically a blank slate. 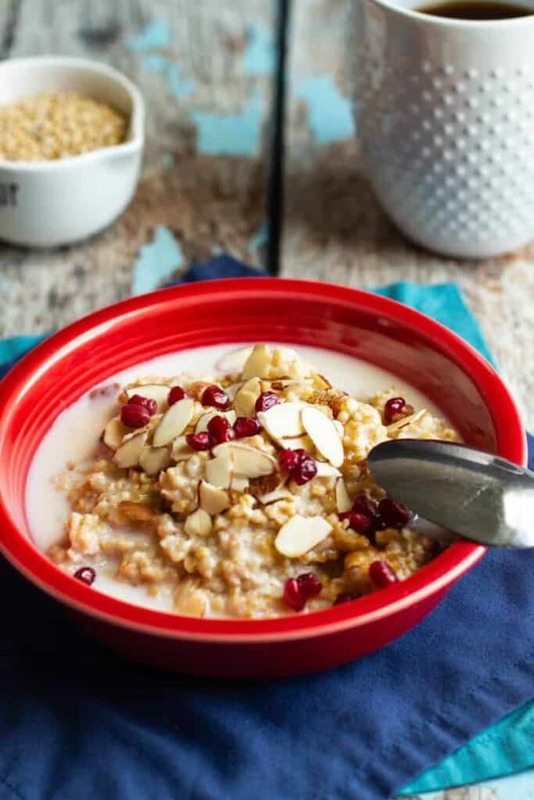 You can flavor your oatmeal and add whatever nuts and fruit you’d like. But without a doubt, the biggest benefit of using the pressure cooker is that everything cooks very quickly. The proportion of oats:water was taken from The Kitchn; the method is based on my trial and error. Spray the insert of your electric pressure cooker with cooking spray. Add the steel cut oats, water, and salt to the pressure cooker. Pressure cook for 8 minutes on high pressure. Allow the pressure to release naturally. 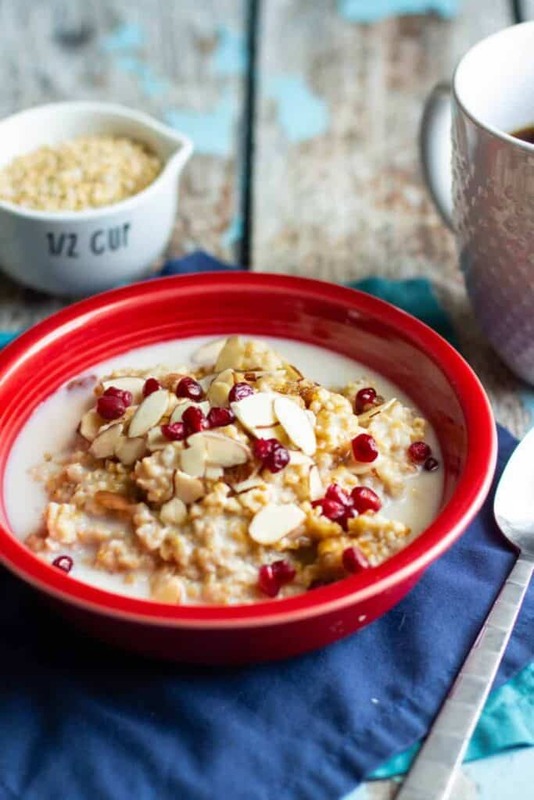 Top your oatmeal with whatever toppings you desire. Notes: For toppings, I went with almond milk, brown sugar, sliced almonds, and pomegranate arils. 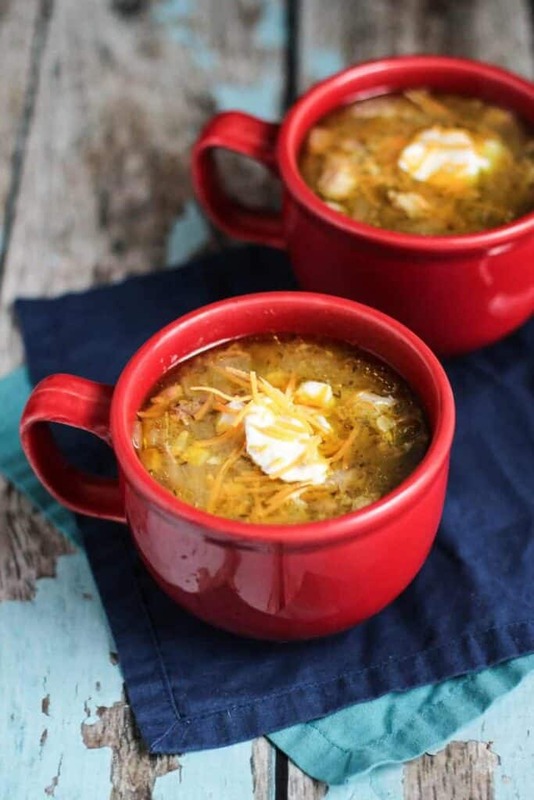 Have more time on your hands to prep for breakfast? 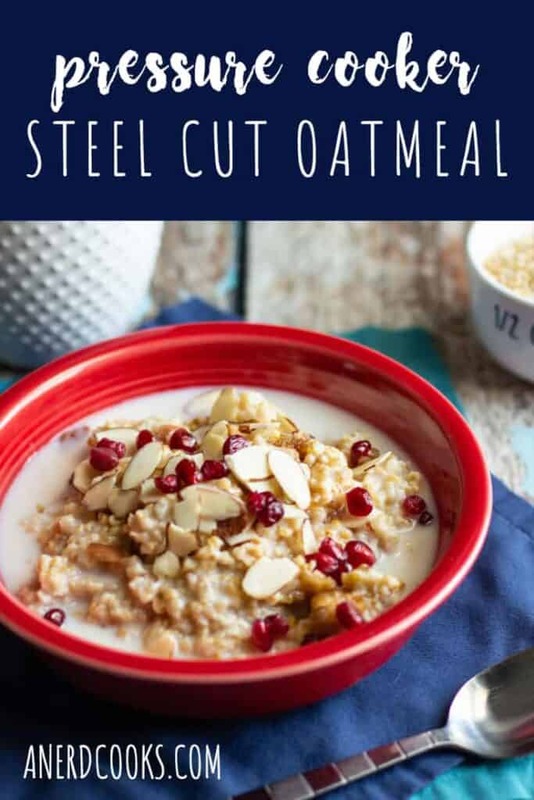 Consider this Slow Cooker Steel Cut Oatmeal, instead! 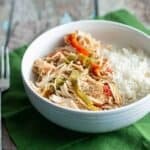 Looking for other recipes to make in your electric pressure cooker? I gotchu. 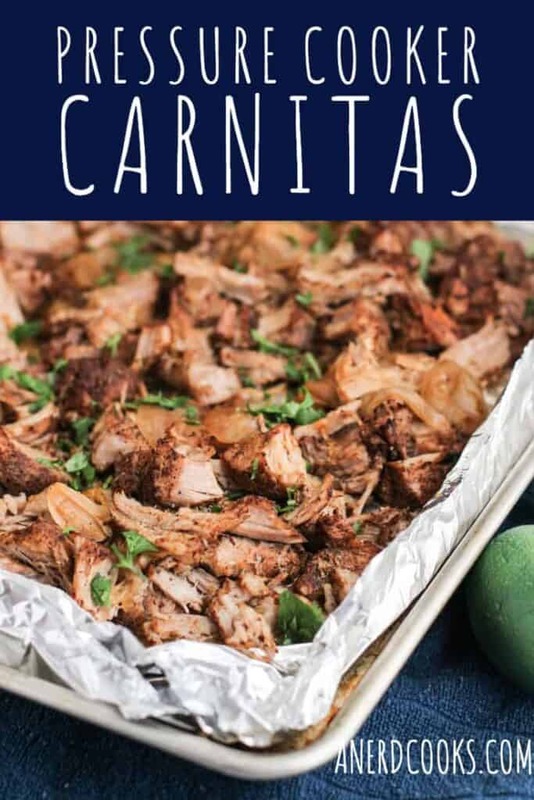 Pressure Cooker Carnitas are a favorite in my house! It also comes together really quickly thanks to it being prepared in an electric pressure cooker. 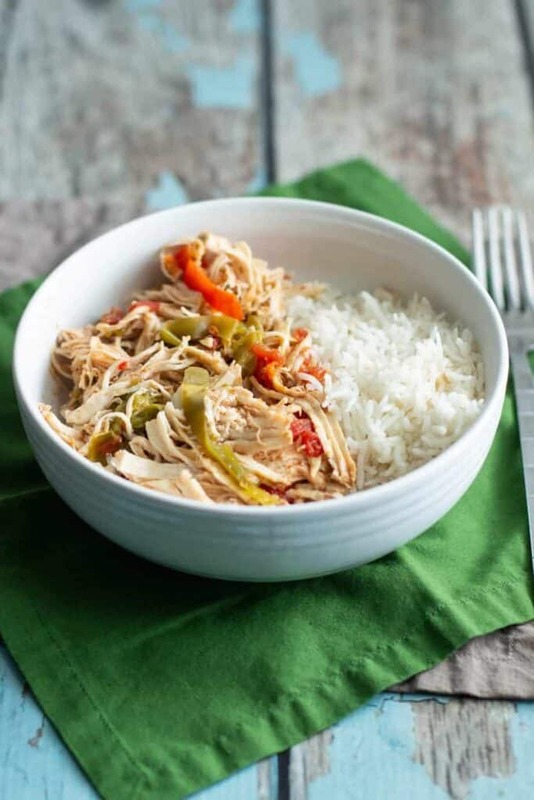 And since the weather is already too hot here in North Carolina, being able to whip this up in a pressure cooker is a double blessing in that you don’t have to worry about heating up your kitchen. This is quickly becoming a favorite in my house. 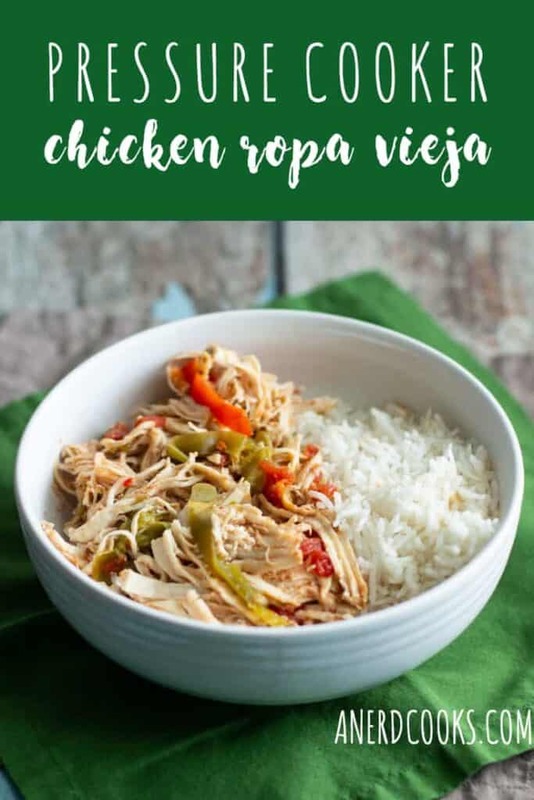 It’s up there with my Three Ingredient Slow Cooker Taco Chicken, Slow Cooker Buffalo Chicken, and Pressure Cooker Carnitas. And that’s saying something, because I make and enjoy those three dishes a lot. 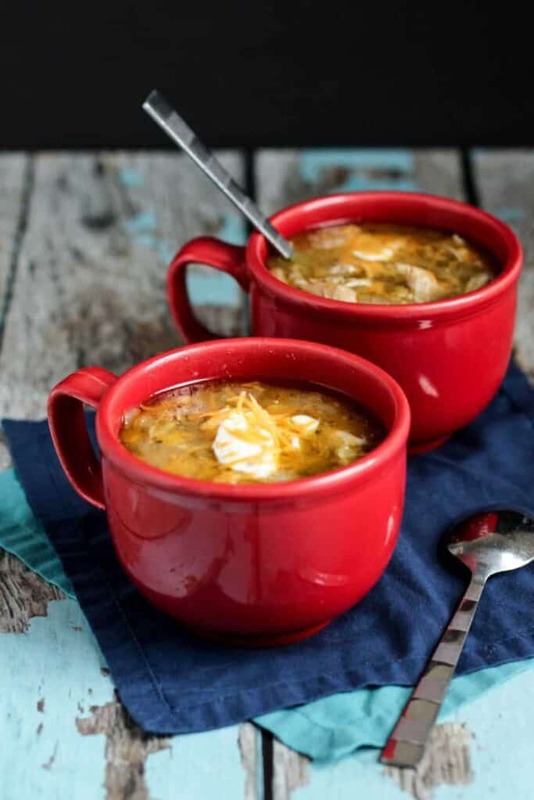 This recipe is adapted from one found on Budget Bytes. Mince the garlic and set it aside. Slice the onion into half-moons and cut the bell peppers into strips. Set aside. 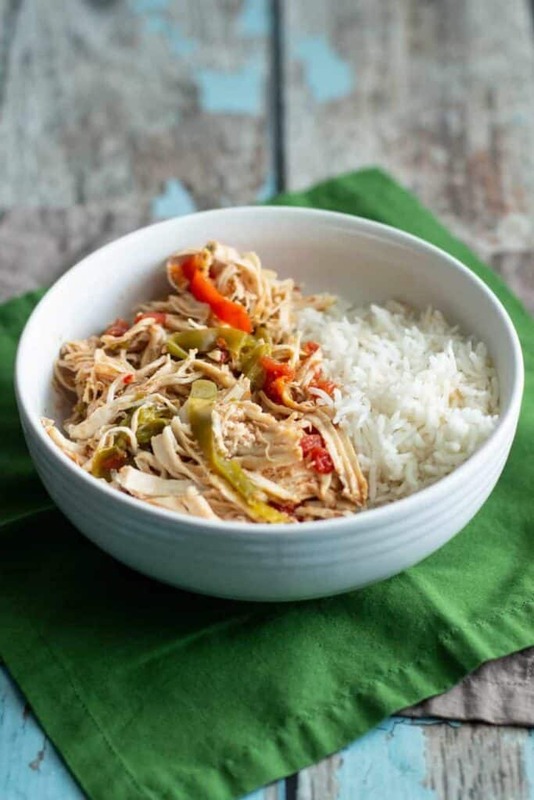 Place the chicken breasts in an electric pressure cooker. Top with the garlic, spices, and sliced onions and peppers. Add the can of tomatoes (with juices) and tomato paste. Place the lid on the pressure cooker and lock it. Cook for 25 minutes on high pressure. Allow the pressure to release naturally. 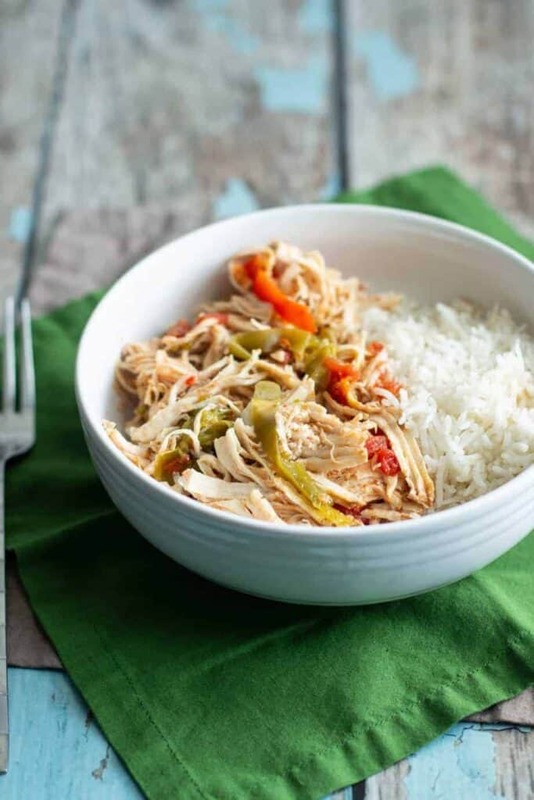 Shred the chicken with two forks. Salt to taste. 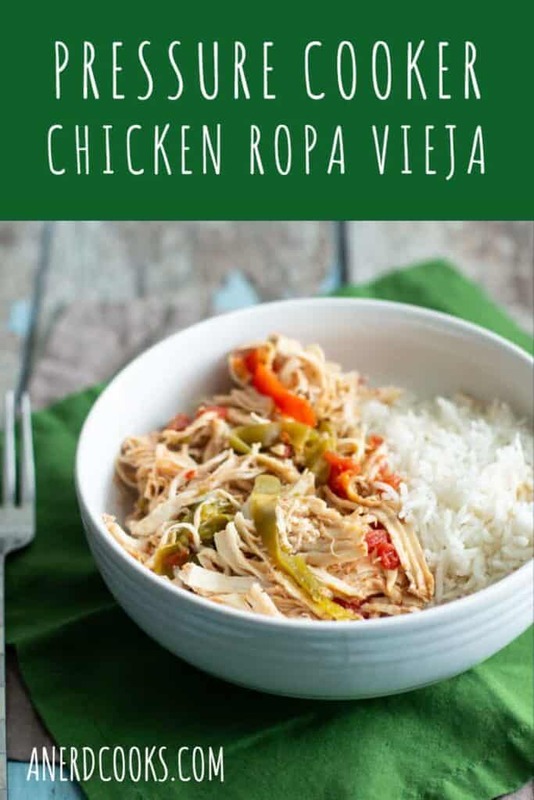 Serve the ropa vieja in a bowl, over rice*, in tacos, etc. 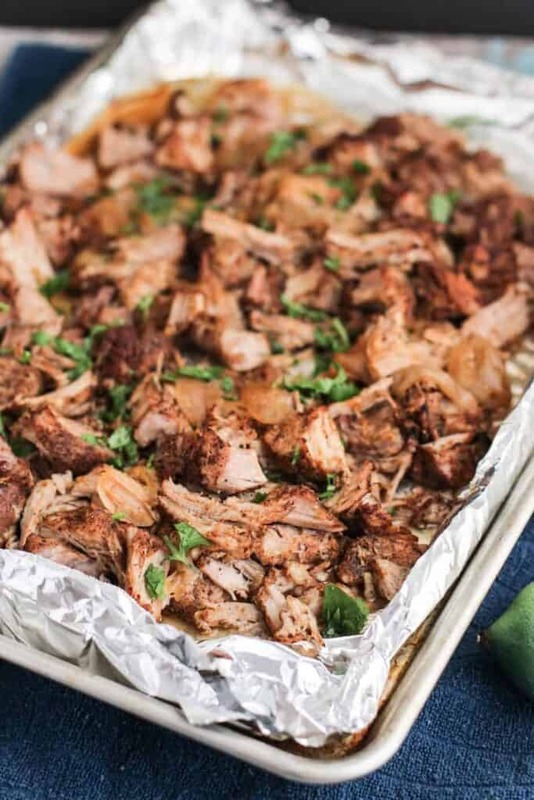 Notes: This ropa vieja is great served over my Cilantro Lime Rice! 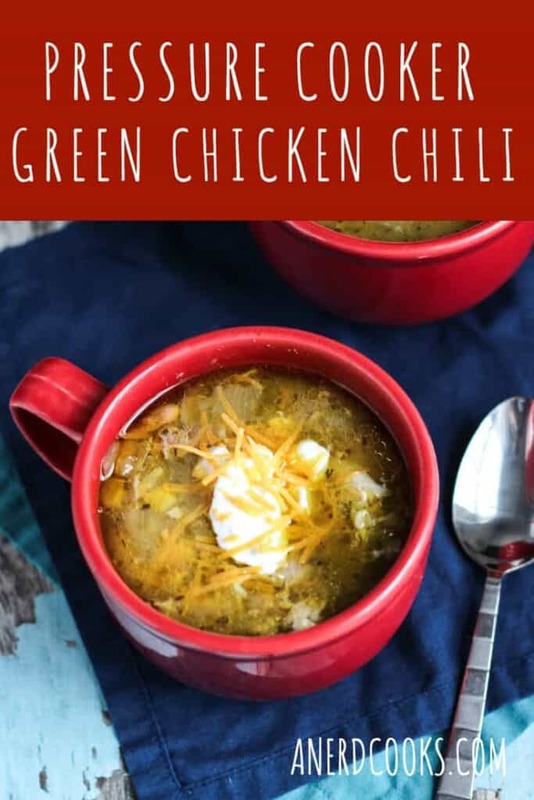 This Green Chicken Chili is super flavorful and a little spicy. Best of all, it comes together quickly in the pressure cooker! Like so many others out there, I received an electric pressure cooker for Christmas! Based on my observations on various social media channels, I know that the Instant Pot was a very popular present to give and receive. My parents picked up this Farberware model for me. I’m just a little bummed that I waited this long to start using an electric pressure cooker. They’re so convenient! I love that you can throw an entire meal in there and have it on the table in like half an hour, with hardly any effort on your part. 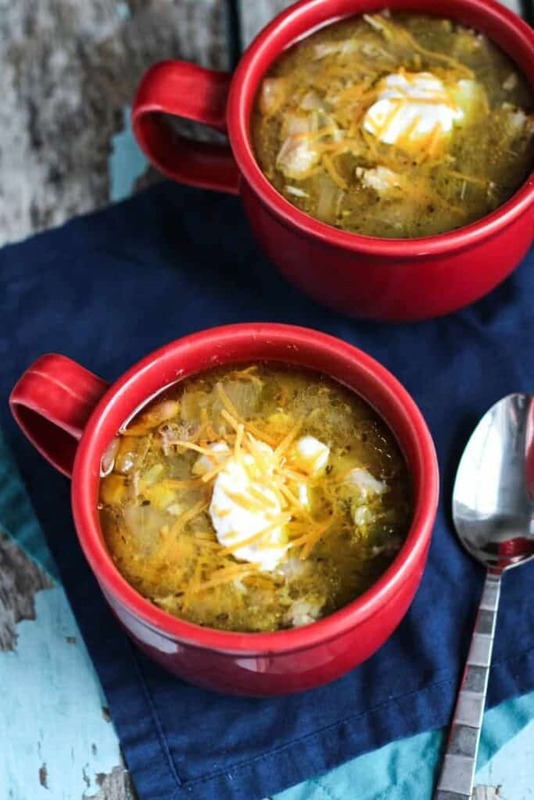 This chili is as convenient as that, too. Just sauté some vegetables right in the pressure cooker before adding the rest of the ingredients, locking the lid, and stepping away. A little more than half an hour later and you have a seriously delicious chili. I’ve made it twice in the past two weeks. And since there are only two of us in the house, we get to have leftovers throughout the week. Perfect. Add the olive oil to your electric pressure cooker insert. Using the sauté/brown function, heat the oil and cook the onions, garlic, and jalapeño for 3-4 minutes. Add the cumin and oregano and sauté for another minute or two. Add the chicken thighs, diced green chilis, enchilada sauce, cannellini beans, chicken broth, and frozen corn to the pressure cooker insert. Place the lid on and lock it. Cook for 25 minutes on high pressure. Allow the pressure to release naturally. 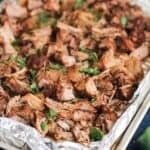 Open the pressure cooker and remove the cooked chicken thighs to a plate. Shred with two forks and return to the chiil. Taste, and add salt and pepper to taste. 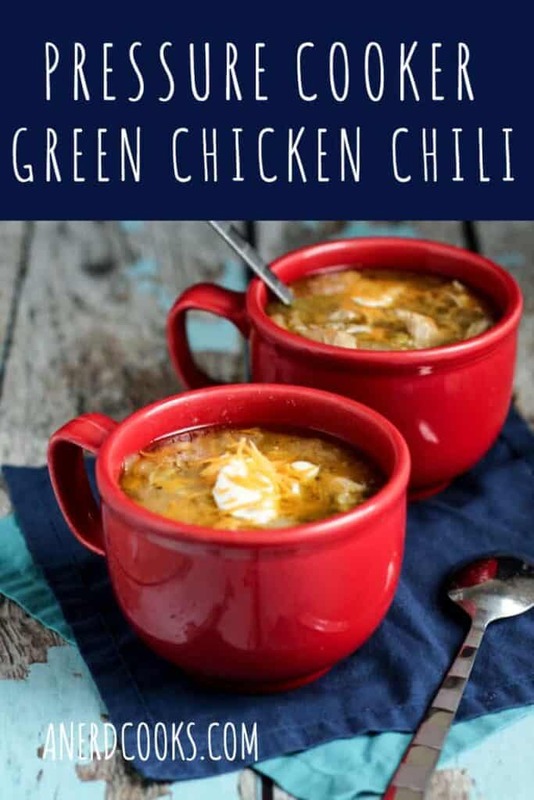 Ladle into bowls and top with cheese, sour cream/Greek yogurt, and crushed tortilla chips (we like multigrain), if desired. Notes: A few readers have mentioned, via Facebook and Reddit, that this chili is a bit on the thin side. 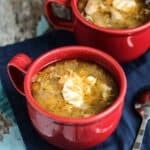 You can feel free to reduce the amount of chicken broth that you use if you prefer a thicker chicken chili.